The long-range, low-power grid comms startup gets a foothold in an international smart grid showcase. On-Ramp Wireless says its proprietary communications technology can connect thousands of smart meters at one-fifth the cost of competing networks. Now it will have a chance to test that claim in one of the world’s biggest smart grid test beds: South Korea’s Jeju Island. On-Ramp announced Tuesday that telecommunications giant Korea Telecom (KT) and smart meter company Fountain Springs would be using its Ultra-Link Processing (ULP) system to connect smart meters on Jeju. That’s a nice foot in the door for the San Diego, Calif.-based startup, which promises long-range, low-power communications that can cover thousands of square miles, yet still be picked up through manhole covers and other physical obstructions that can cause trouble for other wireless technologies. On-Ramp has previously tested its proprietary technology with hometown utility San Diego Gas & Electric, successfully linking meters and other devices across 4,000 square miles of territory using only 35 access points. Late last year, it won a $2.1 million Department of Energy grant to test its technology with SDG&E and Southern California Edison, with results due later this year. On-Ramp was founded in 2008, and raised $11 million of a $14.7 million round in June 2010, along with an undisclosed investment from General Electric and its Ecomagination venture capital partners. Tuesday’s announcement would appear to add KT’s endorsement to that list of backers. Still, On-Ramp will need plenty of endorsements to get the industry to accept its proprietary technology in place of more common systems like cellular or wireless mesh. On-Ramp didn’t disclose financial details of the KT-Fountain Springs partnership, or just how many smart meters would be deployed using its technology. While the island itself only has about 6,000 households to link in its “smart green homes” phase, the project will also be linking schools, wind turbines, transmission lines, plug-in vehicles and energy storage systems. But there’s certainly room for growth. 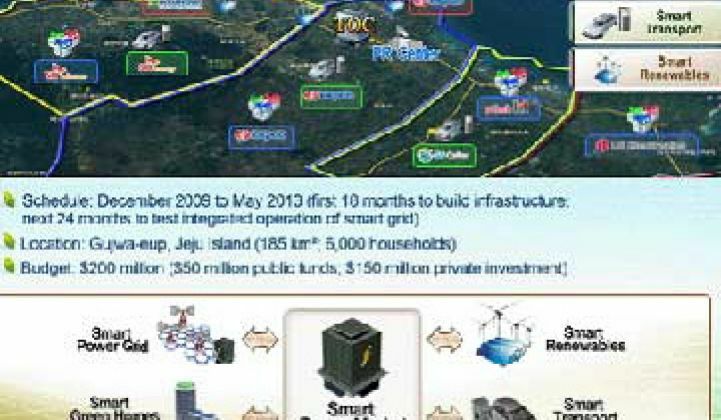 The Jeju project is getting $60 million in government funds and $160 million more from private partners like IBM, SK Telecom, LG, Nuri Telecom, Korea Electric Power (KEPCO) and Hyundai, making it one of the largest smart grid projects in the world. It’s also a test bed for South Korea’s broader plans for a multi-billion dollar nationwide smart grid -- and a chance for South Korean firms to test out smart grid technologies for the global market. On the domestic front, KEPCO has said it will invest $1.8 billion in smart grid over the next five years, giving a sense of the scope of the country’s internal smart grid ambitions. KT, for its part, announced an interesting project with LG and the Building Owners and Managers Association of Chicago in June to pilot smart grid technology connecting a dozen office buildings, and has inked smart grid partnerships with Cisco and SAP in the past two months. Whether its global ambitions will include future partnerships with On-Ramp remains to be seen, of course.